You have probably heard it many times already, haven’t you? Data (big or small) is the new “Holy Grail” or the “New Jerusalem of modern Marketing”. When it comes to Programmatic Trading of advertising inventory, data – in a similar fashion to Jerusalem for the Abrahamic religions Judaism, Christianity and Islam – sits at the epicenter of a fierce “war” between Advertising Agencies, Third Parties (i.e. Google, Facebook, Amazon) and Publishers, while Advertisers and Consumers (still) sit on the fences. 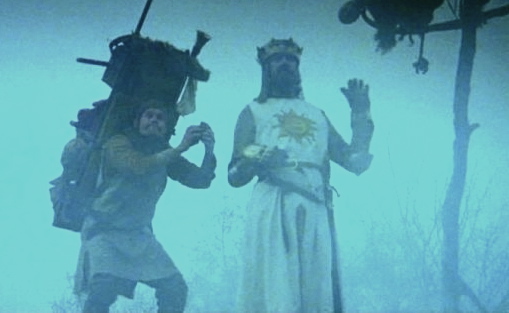 There is a famous, for its absurdity, dialogue in one of my favorite Monty Python movies, “Holy Grail” in which the discussion goes so derailed that one of the guards ends up asking King Arthur if he is suggesting that coconuts migrate. I tend to believe that the discussion we have about Programmatic Trading & Data today is following the exact same route. There is a lot of noise but limited understanding of the way revenues and margins are being made. I guess the situation is very much similar to the situation the average crusader was facing back then. Jerusalem had a mystic sacred quality and it was very few who grasped the politico-economic motives behind the Crusades. Before discussing the intricacies, let us first agree on a lingua franca ok? For advertisers it means data gathered through their direct relationship with the consumer. Demographic Data, CRM & Purchasing Behavior Data, usually fall under this category. For publishers data gathered through the interaction users are having with their properties. Registration Data, Navigation/Behavioral Data are typical examples of such data. First-party data is for each of the parties the most useful form of data, as it is almost free, abundant and continuously updated. What it lacks though is scale. Interacting with an individual brand or publisher is just one of the things multi-tasking consumers are doing these days. There is also a third source of data widely known as third party data being gathered by commercial entities that do not have a direct relationship with consumers. Providers of this kind of data gather information from various online and offline sources, then they normalize it and they resell this data to advertisers, agencies, or publishers who want to enrich their own data sets. There are several companies doing just this for a living (e.g. Axciom, Blukai, Lotame etc). Because data for advertising purposes is useful as long as it gives an actionable indication about a user in terms of: who he is, what his disposable income is, what kind of products/services he is interested in and what his propensity to buy is. To put it simply, for advertisers and agencies, using the data in their platforms means better ROI. For publishers, it means bigger revenue and higher prices for their inventory (better eCPM). Not using this data is like selling the Holy Grail at the price of a metal cup. Data can be one of the saviors of Display Advertising especially as it blends with Programmatic Trading & Real Time Bidding. For, every impression can have incremental value when it comes with consumer data indications. Now imagine yourself in a room full of digital publishers, advertisers and agencies. Ask out loud how they are currently making use of this data for advertising purposes. Guess what! “We don’t” they all reply with one voice. What’s even more surprising is the fact that most of us have fully given away this power to third parties, like Google or Facebook, leaving lots of money on the table. Whenever a publisher is using Google Display Network or a similar black-box service to monetize his inventory, he is allowing that third party to gather a certain set of publisher first party data. In addition to buying inventory in bulk prices from publishers that is Google also gets their data for free. And it is pretty much the same with advertisers, as players similar to Google capture the data from any advertising campaign and use it to enhance its overall offering. b) Campaign data that the agencies and advertisers are freely providing (with every campaign they run). c) First party data from its own properties (Google Search, YouTube etc.). It is this holistic view of the consumer that allows Google to be able to create the added value (and the sky-high margins). It buys bulk undifferentiated inventory from the publishers and it resells it at a much higher price thanks to the data layer that it has put on top. Clever isn’t it? The Programmatic Data Crusade is going to be about advertisers and publishers trying to reclaim control of this new Holy Land (and the margins this entails) and maintain strategic independence. Advertising agencies have been consolidating to create the necessary scale and expertise with specialized units – Xaxis, Accuen, Cadreon, Amnet, Vivaki – in order to “fight” Google and several other third parties. Publishers are justifiably in frustration. They see their market shares decline every day. Being the smaller fish in the pod, they do understand that they need to move faster and smarter or they risk ending like Arthur bagging coconuts instead of having a real horse but they lack the necessary resources. This feeling is even stronger in regions like CEE and MENA, where fragmentation is bigger and the markets relatively small to justify and depreciate bigger investments. A) Publishers devising their own independent commercial strategy with Data and Programmatic Trading at its core. Their offering towards agencies is further enriched with audience driven packages being traded in an automated way (Programmatic Direct). There are lots of them who are also already experimenting with their own Private Marketplaces built around the data they have and their unique premium context. B) Publishers, on top of their individual strategies, are also consolidating parts of their inventory (usually their remnant part) in bigger Publisher Alliances. They do this to build the necessary economies of scale to claim back part of the money they have left on the table. Wide reaching publisher marketplaces are already growing like mushrooms all over the world, providing local publishers with the only way to reverse the trend which has seen advertising budgets slip away. The key notion here is “partnership” and, unlike what has been the case in other markets, it seems to be the new norm for local publishers. That said, publishers need to partner with specialized ad-technology companies to climb fast the learning curve and excel in their individual strategies. Incrementally they also need to partner with each other to create the necessary scale to reclaim “Jerusalem”. So, are we ready to fight this “Holy War” together or “are you suggesting coconuts migrate”?